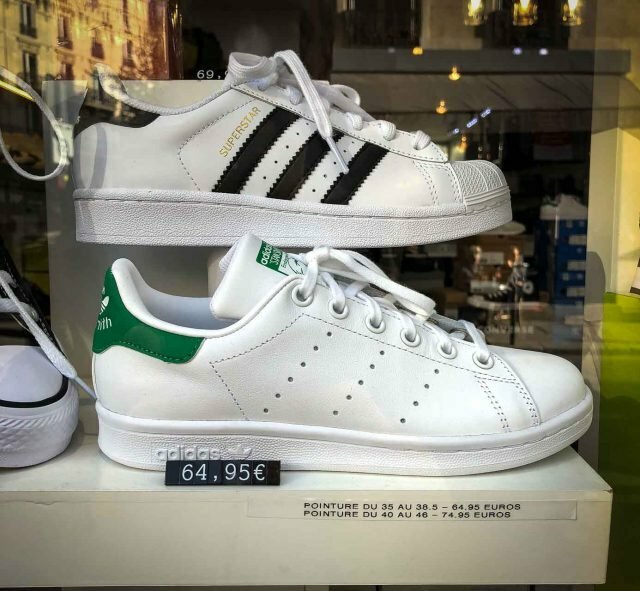 Fast forward to right now and the ne plus ultra of sneakers in Paris have been Stan Smiths, which I began wearing when I was twelve years old. Parisians are starting their kids off the same way and I’ve seen families of four, marching down the overly trendy rue de Bretagne on a Saturday afternoon, each adult and child wearing the classic white tennis shoes with the signature forest green labels trailing behind them. As is bound to happen to any trend (which seem to hold on in Paris longer than they do elsewhere), such as the mojito, which finally was displaced by twenty-sometimes when the Spritz showed up on the scene, Stan Smith sneakers have been on the wane. No one is quite sure which direction les baskets, as sneakers are called in French, are going, or banking their euros (and wardrobes) on which sneakers to own. (Wikipedia France clarified tennis shoes are also referred to as les tennis, a term which is, of course, accompanied by a photo of Stan Smiths, whose caption notes they’re très populaires.) But les baskets have become the shoes of choice to wear in France. The French are sportif, and the shoes are more comfortable. And these days, no self-respecting jeune wouldn’t be caught dead not wearing sneakers when joining their basket-clad friends for a Spritz in a café. I’ll have to admit that I felt a bit proprietary of Stan Smith sneakers. My childhood had been co-opted by les bobos, and I stopped wearing mine around town, switching to New Balance. But locals seem to be following my lead, again, and jumping on the New Balance bandwagon, probably because they are the most très américain of the lot. Indeed, no longer is it declassé to be très américian, but branché. So, theoretically, I’m back again, ahead of the curve around town. I never would have imagined that one day, I’d be at the forefront of style in the most stylish city in the world. But as an about-face, a French brand, Veja, came on the scene, whose sparse website seems to echo their basket beliefs; transparency, organic, and fair-trade sourcing. To be honest, they’re pretty cool. (And to be honest, cooler than me.) It’s not just because they use “wild rubber,” but I like their clean look, colors, and lines. Oh, and they also make vegan sneakers as well. Nowadays I’m overflowing with baskets, and tennises, so I’m not quite ready to add more to my collection, even if the French baskets are cooler than ours. And I’m finding that I haven’t worn my black shoes in months, maybe years. So I guess I’m following in their footsteps, and at the same time, becoming more French. I enjoy you so much! Thanks for your blog/Instagram. Why is it that trends linger in France? I guess because they have that ‘cadre’ mentality. I was talking to a caviste (wine shop owner) and we discussed the same thing. I remember when no one would touch rosé in Paris, and now the supermarkets and wine shops are filled with bottles every summer. (The mojitos were everywhere for years. 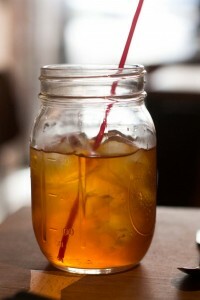 Often in the drinks category, those trends are fueled by marketing campaigns.) Stan Smiths lasted a long time as well but they seem to be on the wane. I wonder what will be next? Oh, the rosé! My husband is a fan, and just a few years ago had not much to choose from in the local G20 supermarket. Last visit — he counted 65 (!) (!) varieties of rose in our relatively small neighborhood store. And that was at Christmas! Hallelujah…..I’ve been wearing All-Stars almost 24/7 for 6 years and finally am not getting crazy looks here in the Netherlands. Nothing beats comfortable sneakers, and so happy the EU has finally joined the bandwagon. Makes travel so much easier…don’t need all those extra shoes you only wear with one outfit! What a terrific article! David’s insights about life in Paris – not to mention his fabulous culinary talents that he generously shares – are treasures. Looking at Stan Smith’s right now!! Interesting post. I do like New Balance. are Vans recognised/worn there? I’ve had to move over to sneakers because I developed heel spurs. My problem with them as an every day shoe in winter is that they aren’t warm enough. Gortex with appropriate sock liners! Try trail runners/hiking shoes. Mine are gortex so very water resistant and have much better grip. I need to fit orthotics in them. I wear warmer socks if it’s horribly cold. I found that sneakers made of vinyl (now called vegan ha ha!) are warmer than those made of leather or mesh. I was in Paris for a week last winter (Jan 2018). Not a tourist heavy time. There were so many people wearing “trendy” sneakers–a lot of New Balance in single colors. A shoe I myself find attractive and have owned at times. There is so much to be said for comfort and support. Because of my particular foot & ankle issues I wear Merrell trail shoes most of the time in as quiet colorways as I can find. They read like hiking boots, but I can’t walk in anything else. The only sneakers that work for me are the gigantic super-supportive ones that are even too huge and puffy for this through and through American! The only comfortable dress shoes I have (now the ONLY dress shoes) are a pair of black Mephisto ankle boots. Tres chic and truly comfortable but they were so expensive that I’m afraid of wearing them out; the style is discontinued; and they don’t have replaceable soles. So I wear them to restaurants and theaters and feel quite glam when I do. I wore their oxfords for years, but then they stopped working for my foot. Oh well. I love the Merrill barefoot shoes, too. I’ve worn them to work and running errands. I adore my Rothy’s, and wear them almost exclusively. I can walk all day in them. So now we’re going to be able to spot Americans because their dated guide books tell them to wear dark leather shoes? Even if Parisians are wearing baskets, I’M guessing that they still do not pair them with shorts in public? Fun post, David! The trouble with guidebooks (and even blogs!) is that information/customs change. People do wear them with shorts, or sandals. Yes tennis or baskets can be worn with shorts but it is a tricky thing : not every basket with any short shape. Last April when I visited Paris I was shocked to see les baskets paired with flowery, frilly dresses in nearly every shop window. I lived in France 30 years ago, when no self-respecting French person would have been caught dead in those white shoes. As someone who had bunion surgery on one foot and probably should do it on the other, I am thrilled with the sneaker trend. I do recall that once upon a time, “ugly tourist” included white sneakers. And my husband was refused entry to the Campbell bar for wearing sneakers. For an excellent laugh, listen to the podcast “Everything Is Alive,” in which the sponsor, brilliantly, is Adidas and the real Stan Smith is interviewed by a “pair of Stan Smiths.” So meta. I’ve always believed that les baskets referred to high top sneakers while les tennis was used to designate the low cut ones. Baskets seems to be the all-encompassing word for sneakers. I haven’t seen many (or any) high tops, but they are likely out there, too. 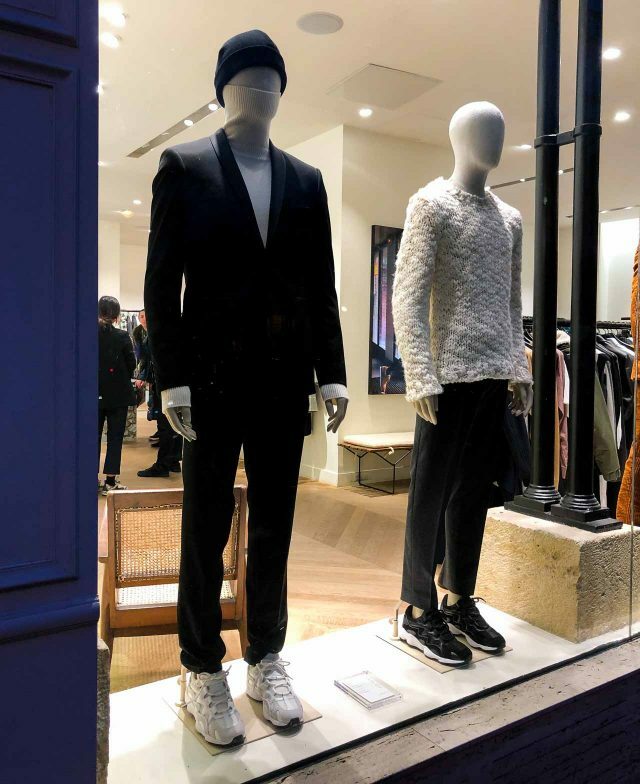 We spent April and May two years ago in the Marais and all we saw were sneakers. And, when the weather warmed up in May, we even saw locals wearing (gasp!) flip flops on the street. We are going back in April and I’m bringing black sneakers for the day a black leather shoes for the evening (and no flip flops). I guess I’ll be hopelessly out of style. Love your posts and today I learned a new French word- branché. Merci ! The American influence is ubiquitous here, sadly. Even my French friends are bemoaning their loss of culture, and not just a little but more all the time. McDonalds burgers (ugh) are advertised so much on TV and just like in the States Burger King lets McDonalds figure out where traffic warrants a location and then across the street will follow the Burger King. I guess all those YouTubers will have to modify their “What to Wear Not to be Labeled a Tourist”. Veja-owning American here! They are worth every penny. When my boyfriend and I went to Paris in 2014, he wore bright orange new balance 574s the whole time. A daring move, but he received several compliments on them (in French). Great post. I clearly remember in Paris learning the phrase ‘basket blanche’ as a term of derision for an American tourist in my 2004 French class. And being scolded by the waiter in 1986 Geneva for ordering salad at lunch. Still and all, France and Europe are special… hope stays that way. No New Balance for me. Trump supporters. Perfect timing! We’re visiting Paris in a few weeks and here I thought I was going to have to accept the blisters from my more fashionable, but not walking-friendly, flats. Now I know I can mix in my white NBs and maybe even floral Vans and feel less touristy. I just love your recipes and foodie advice. Shoes? Yikes! There is no elegance anywhere any more!! Yes I have trouble with my feet and no I don’t want my feet to look huge and cartoonish. My Podiatrist suggests giant shoes for his clients feet, yet he wears the most elegant leather very sleek shoes that are the most wonderful green. The trend of sports clothes for everyone all the time, with writing on them no less, drives me to distraction! I cannot wait for the trend of close fitting clothes to return along with the trend to know how to stay slim and eat right. Sports clothes are for working out, there can be a casual comfortable without being uncomfortable and having to cross over to the dark side. I agree, AB, sports clothes are for working out, not for wearing all the time! What happened to lovely, modest clothing, especially for women. 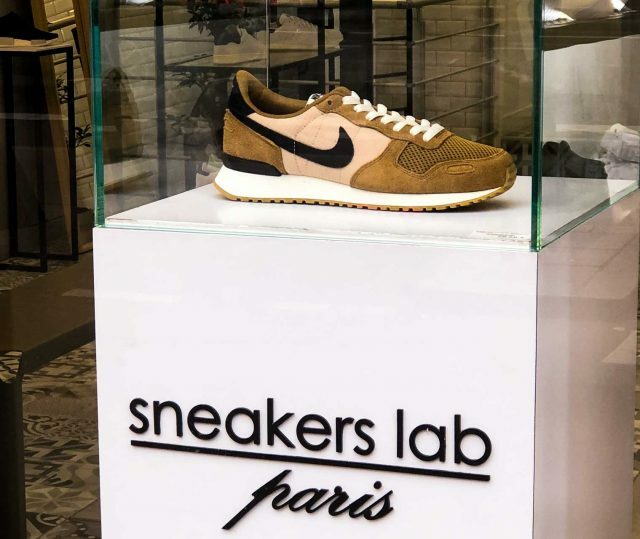 However, I do like David’s take on sneakers in Paris and I’m glad to hear it! I was there in 1992 for a month and I wore my “walking shoes” to lunch at the Ritz Hotel and you should have seen the looks! I thought the maî·tre d’hô·tel was not going to seat us ! The first thing he looked at was my shoes and he actually did sneer. I laughed it off, thank goodness. Lovely lunch, by the way, David — and I love your posts ! I lived in Europe 25 years ago in my youth when there were quite a few differences between (ugly?) American culture and the Europeans. I’m a little saddened that the world is homogenizing. Now, Scandinavian posts about chia seed porridge and avocado toast (over herring and akvavit), yoga pants and les baskets. International trends are boring in a way. (Even if they are comfortable, or yummy). Our French friends three daughters (23, 20, 17) are mad for the Converse Chucks. We sent them each over a pair for their birthdays and Christmas. Judging by the reactions to Instagram posts (via my daughter as I am not age appropriate for that app) all their friends are fans too. I noticed back in September that women were wearing metallic athletic shoes– usually silver, to go with their black outfits. They ranged from shiny silver shoes to grey or white with metal accents. I looked all over when I got home, and finally found a bronze pair which j’adore. How delightful! I’m old, and I wear what is comfortable. I used to love shoes and had many styles and colors; now I love seeing others wear them. Now I wear either Crocs or Uggs, depending on the temperature. Being comfortable results in one being pleasant and kind. Ha ha, I love this! I have to admit that when we spend our 7 months in SW France, I dress differently than I do in the US. But the older I get, the more I welcome the move to more comfortable shoes in France. I still wear mostly black and pants much tighter than I’m comfortable growing up with in the US, but the shoes… bring them on. It’s all about my back now. And I finally feel okay to wear sandals. I stand by the low cost Converse, which my French friends also favored. Several liked searching for the high tops in bold colors. Still wear my Converse, but also wear my All Birds a lot. I once saw a whole group (eight or more people, from children to middle aged people) brunching together at the Ladurée tea rooms on rue Bonaparte. All of them were wearing All Stars! converse chuck taylors are available in all black once in a while in the US. not nearly so gauche as the tennies with the white soles and toes. Well if this doesn’t beat all! After reading this I moved on to a food site I have never visited……and all the ads that were popping up? Pour les baskets of assorted brands.A bit creepy. Is there anything the Internet doesn’t know about us?? Many, many years ago I wandered around Paris in my then, favorite shoes-new, white leather K-Swiss. Often, as I waited for the pedestrian signal to change people would surreptitiously look down at my feet. On two occasions, I was asked if I was a nurse. 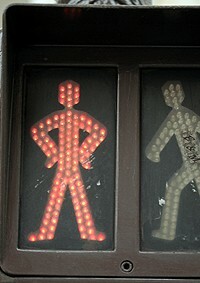 I never realized that was a Parisian “no-no” until several years ago. 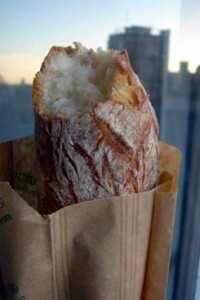 Oh my gosh, this article took me back to my first trip to France in high school in 1973! You do the math….lol! We were NOT allowed to bring tennis shoes or wear jeans. A couple of kids packed Levi jeans and sold them in Paris. It took a long time for tennis shoes to make the scene in France. Thank you for the article, David. Took me down memory lane!!! When my son and I were in the south of France I wanted a couple of Santons, one with a man holding baskets. That’s when I learned that baskets were some type of shoes. We all had a good laugh, which i remember every time I look at that lovely gentleman with his baskets. Gotta say those Nike’s above would look great on any guy as an all around shoe – excellent color combo. Can easily see them with slacks and a jacket. Thank you David. You solved my shoe problem for next month when I am going to Bordeaux. I have very sensitive feet, neuropathy and other conditions and all I can wear c’est des baskets et des Skechers, which you didn’t mention, but they are so comfortable for me. I am going just with a carry on (I have a broken arm still healing) to 2 countries for 2 months, so I am taking 2 pairs of shoes only. I remember my first pair of Stan Smith bought with my first job washing dishes in a restaurant on the weekends. I was 15 and finally got my pair! This was in Alsace, France where the cool kids got Lewis 501 and Stan Smith. My whole paycheck for the pair! I am now 55, live in San Francisco and always amused and delighted to read you! I am working to make every single recipe of your ice creams. So far, all delicious! Merci. The next terrifying footwear trend -for women anyhow- is the “tourist sandal”, basically a version of Tevas. There are designer level options hitting stores now or soon, (fendi, gucci, prada, chanel, etc) but they will be at every price point within the year. Probably not mass market until spring 2020. And yes, with socks for the truly fashion forward types. I am French, when I go to France from Washington I wear my « baskets » to the désespoir of my sister who is so chic. I will no longer wear dress shoes to travel, I love my baskets and I am of a certain age. I am french ,when I go to France from Washington I wear my « baskets » to the désespoir of my sister who is so chic. I will no longer wear dress shoes to travel,I love my baskets and I am of a certain age. By the. Way I have most of your books,l’appart was funny,I felt for you,you were so patient with the worker.. Yes to most of the comments above. But what galls me is the mess of shoes outside the apartment door which is so incredibly inconsiderate to the neighbors. 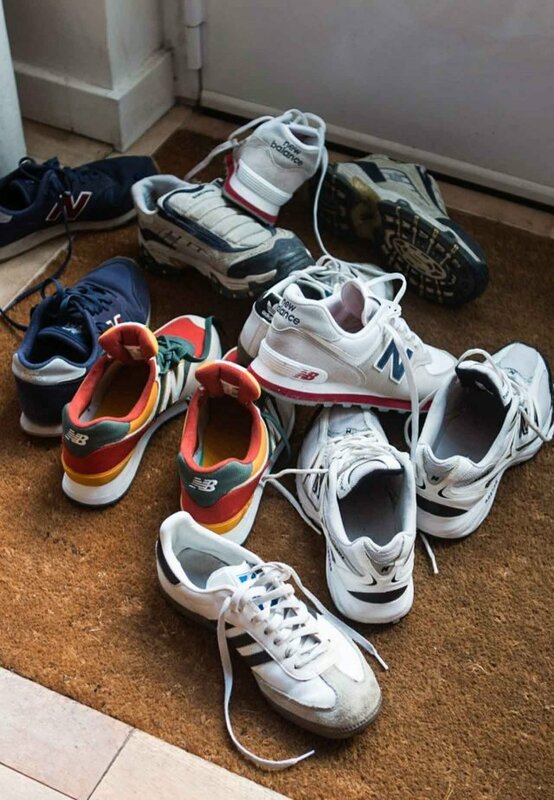 And even if it’s a totally private hallway, the shoes should be arranged neatly. This is the same mentality on the part of parents that leads to permissive parents letting children misbehave in restaurants, etc. Wow! From messy piles of shoes come bratty kids!! I don’t agree, but it made me laugh. Sorry for poor editing above.